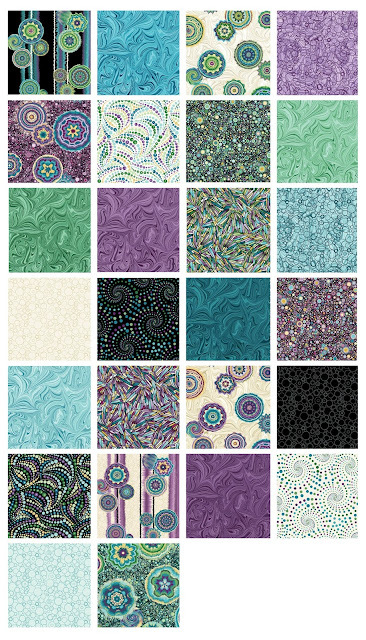 Today we're introducing Ann Lauer's current collection, Circle Play, and giving a sneak peek at her new line, Irresistible Iris, available in quilt shops in July/August. The collections have one main thing in common--glorious purple hues! Your fabric collections so far have been floral themed. Why circles this time? The circle is absolutely my favorite geometric image. And I think that’s the way it is with lots of quilters. Circles are not uncommon in support fabrics. I thought it would be hugely fun to go from simple circles that are the textured background all the way up being the focal print. Almost everything in the line is made up of a huge variety of circles. The stripe. I think the stripe is knock-your-socks-off. You get four repeats across the width in one cut of fabric. You don’t have to center anything. I think those colors are absolutely gorgeous on the black. 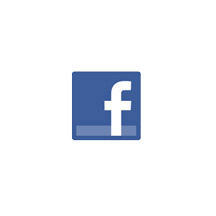 On the cream background, you have the circles in the background. It’s really pretty to cut into blocks, or use for a border. I’m also really excited about the large medallions. There is an immense amount of detail in them, and they printed so well. The detail in the images and then the background they’re floating on gives a huge amount of depth to the print. Easy—they’re my favorite colors. I can’t design every collection in purple and jade, but I really, really like jewel tones. 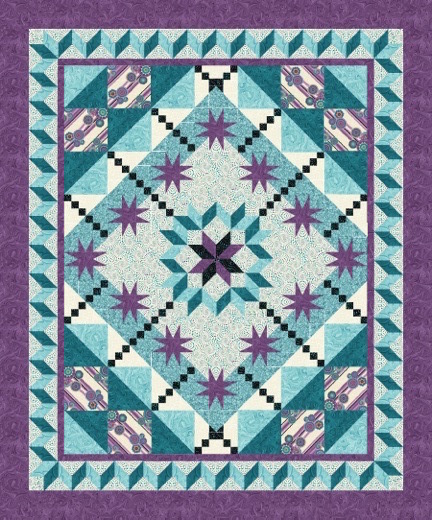 In Circle Play, you can make a quilt out of jade, or out of purple, or mix up the two colors. It’s not two completely separate colorways—they mix together beautifully. They look spectacular on black and really shine on the cream background as well. Anything else you want to tell us about Circle Play? What’s cool about this collection is that all of it (except the stripe) is non-directional. The fabrics can be cut in any way. 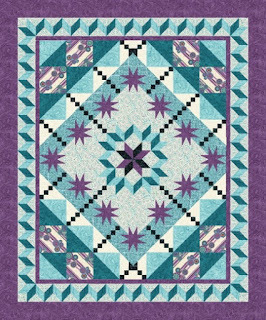 Ann designed "Beautiful Dreamer" with her the Circle Play prints, using a fussy cut strip of the circle stripe for the outer border. 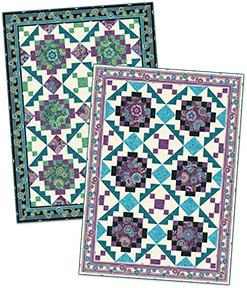 Here are two more patterns Ann designed using Circle Play prints. 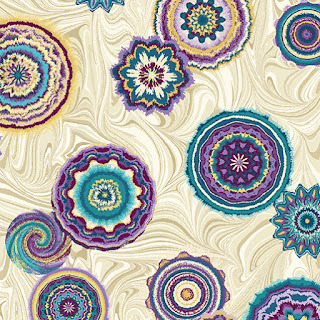 You can find these patterns on her website. Click here to see the entire Circle Play collection. 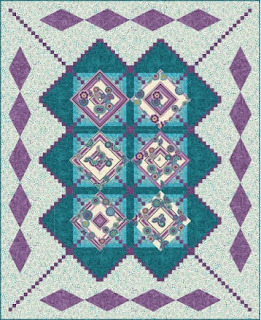 Click here to see more of Ann's patterns and kits featuring Circle Play. Both the Irresistible Iris fabric line and embroidery designs will be available later this summer! 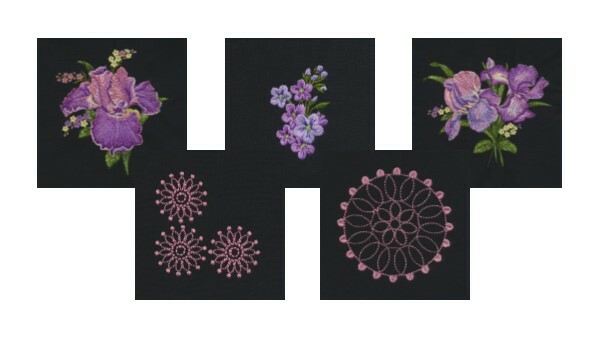 Lovely - love the embroidery designs that go with them too! Could also enhance quilts with the circle maker that is available for many of the sewing machines. 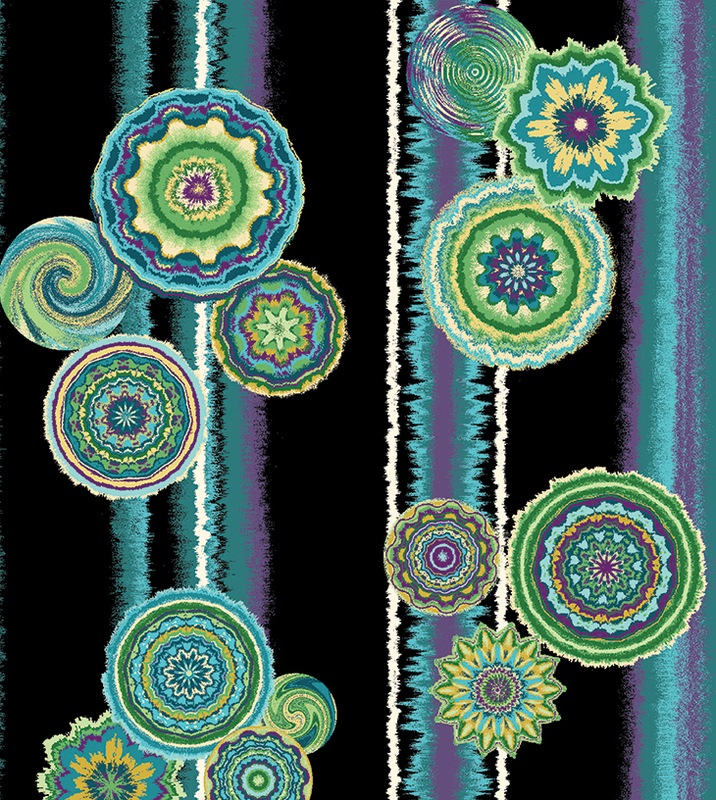 I know I've been playing with my Pfaff and the circle maker attachment with great fun. Wow! This is a spectacular fabric line that I know I will be waiting to purchase! Thank you for sharing the free pattern and the look at all of the beautiful fabrics! I love the colors and tones. I am not fond of sewing circular seams, but I love circles printed on fabrics.